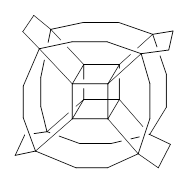 Three-dimensional objects can be projected into four-dimensional objects. 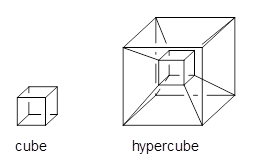 So for example a cube can be projected into a hypercube, as in Scheme 1. Now, unfortunately he does not supply any supporting materials. 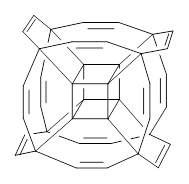 So I have reoptimized this Oh geometry at B3LYP/6-31G(d), and show this structure in Figure 1. Pichierri does not report much beyond the geometry of 1 and the perfluoronated analogue. One interesting property that might be of interest is the ring strain energy of 1, which I will not take up here. 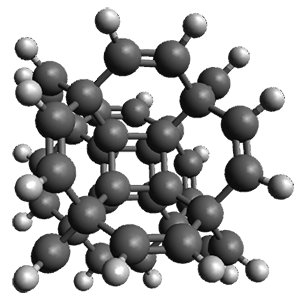 But a question I will take up is just what bridges might serve to create the hydrocarbon hypercube. 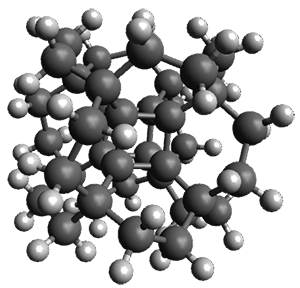 A more fundamental choice might be ethanyl bridges, to create 2. However, the Oh conformer of 2 has 13 imaginary frequencies at B3LYP/6-31G(d). Lowering the symmetry to D3 give a structure that has only real frequencies, and it’s shown in Figure 1. An interesting exercise is to ponder other choices of bridges, which I will leave for the reader. As always, be sure to click on the image to enable Jmol for interactive viewing of these interesting structures! (1) Pichierri, F. "Hypercubane: DFT-based prediction of an Oh-symmetric double-shell hydrocarbon,"Chem. Phys. Lett. 2014, 612, 198-202, DOI: j.cplett.2014.08.032.